New York: Harcourt, Brace & Company, 1958 First edition, limited issue of 300 copies numbered and signed by the author, this copy being number 177. Publisher's bright blue cloth with "95" stamped to boards in blind, lettered in gilt to front board and spine, top edge stained yellow, with yellow endpapers; in the original glassine jacket and publisher's black paper slipcase with white title label lettered in gilt. About fine with just a touch of sunning to extremities; glassine jacket with significant chipping to extremities and split in two at the spine panel, a few pieces detached but laid in; slipcase about fine with some light soiling to label. Overall, a beautiful copy, signed by Cummings. 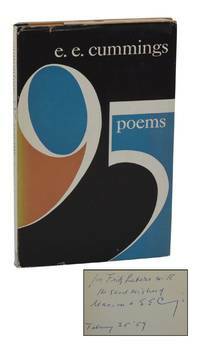 95 Poems is the last collection of new poetry published before Cummings' death in 1962. Specifically, it includes many of the author's most well-known poems, including "i carry your heart with me," "l(a," "dive for dreams," "if the Lovestar grows most big," "i love you much (most beautiful darling)," and "rosetree,rosetree," among others. 95 Poems represents the reflections of a mature poet, with the poems discussing Cummings' meditative thoughts on life, nature, time, and love. Like much of Cummings' verse, many of the poems in this collection draw beauty from their simplicity without sacrificing the deep emotions they address.. Signed by Author. First Edition.. Hard Cover. Fine/Dust Jacket Included. New York: Harcourt, Brace and Company, 1958. First Trade Edition. Near Fine/Very Good. First trade edition, first printing; preceded by a signed limited edition of 300 copies. Signed by E. E. Cummings and inscribed by him to former owner. Near Fine with slight shelf wear, Small patch of offsetting and small piece of tape to front paste down, perhaps where a newsclipping was once taped. In a Very Good price-clipped dust jacket, with slight fading, light edge wear and a 1-3/4" closed tear to the top edge of the rear panel. The last book of new poems published during Cummings' lifetime; signed first trade editions are scarce. New York: Harcourt, Brace and Company, 1958. First Edition. Hardcover. Very Good. First trade edition, first printing; preceded by a signed limited edition of 300 copies.Very Good or better, lacking the dust jacket. Rubbing through at tips, rear cover unevenly sunned at top edge. Previous owner name to front free end paper, and toning to pages. Else a rather nice copy of the last book of new poems published during Cummings' lifetime. 2002-08-07. New. Ships with Tracking Number! INTERNATIONAL WORLDWIDE Shipping available. Buy with confidence, excellent customer service! Liveright. PAPERBACK. 0871401819 New Condition. . New. 2002-08-07. Good. Ships with Tracking Number! INTERNATIONAL WORLDWIDE Shipping available. May not contain Access Codes or Supplements. May be ex-library. Shipping & Handling by region. Buy with confidence, excellent customer service! Liveright. PAPERBACK. 0871401819 Like New Condition. . Fine. Harcourt. Used - Acceptable. Former Library book. Shows definite wear, and perhaps considerable marking on inside. Harcourt. Used - Good. Shows some signs of wear, and may have some markings on the inside. Liveright. PAPERBACK. 0871401819 Brand New ,Original Book , Direct from Source , Express 5-8 Business days worldwide Delivery. . New. Liveright. PAPERBACK. 0871401819 Special order direct from the distributor . New. New York: Harcourt, Brace & Company. 1966. F First Edition. H Hardcover. Very Good. In jacket over cloth backed boards, 8vo, [ca. 110] pages (unpaginated). Notable for the inclusion of the controversial poem "Thanksgiving (1956)", as well as the jacket lower flyleaf blurb by Lionel Trilling. (shelfwear, fading, soilng and sm. nicks to jacket extremities, name/place/date to title page at upper edge). Liveright. PAPERBACK. 0871401819 . New. Liveright. PAPERBACK. 0871401819 Remainder mark . Fine. Liveright. PAPERBACK. 0871401819 *BRAND NEW* Ships Same Day or Next! . New. Liveright. PAPERBACK. 0871401819 *LIKE NEW* Ships Same Day or Next! . Fine. Liveright. PAPERBACK. 0871401819 BRAND NEW, GIFT QUALITY! NOT OVERSTOCKS OR MARKED UP REMAINDERS! DIRECT FROM THE PUBLISHER!|0.5 . New. New York: Harcourt Brace & World. Fine copy. 1970. Later prt.. hardcover. 8vo, 95 pp. .
Harcourt. Used - Good. Good condition. NY: Harcourt, Brace & World, Inc., 1958. good used no markings medium wear in a used-up jacket.. 1st. Hardcover. Good/Poor Jacket. 8vo - over 7¾" - 10" Tall. US: Harcourt. Paperback. 0156659506 Literature & Fiction Very good. Minor crease. 95p books carefully packed and shipped promptly . Very Good. 1971. New York: Liveright, 2002. Reprint. Paperback. Very Good. 8vo - over 7¾" - 9¾" Book is in very good condition. General shelf and handling wear. Interior is clean with a tight spine. Harcourt, 1971-06-01. Paperback. Very Good. A trade paperback in excellent condition, clean with a tight binding and an unmarked text.From a private smoke free collection.Shipping within 24 hours, with a tracking number and delivery confirmation. Harcourt. 1971. Later Printing Used. Paperback. Very Good. Liveright. PAPERBACK. 0871401819 Very Good Condition. Has some wear. Five star seller - Buy with confidence! . Very Good. Liveright. PAPERBACK. 0871401819 Ex-library book with usual markings. Good Condition. Five star seller - Buy with confidence! . Good. Liveright. Paperback. POOR. Noticeably used book. Heavy wear to cover. Pages contain marginal notes, underlining, and or highlighting. Possible ex library copy, with all the markings/stickers of that library. Accessories such as CD, codes, toys, and dust jackets may not be included.